Rules of Golf: So You Are Going to Play Match Play! 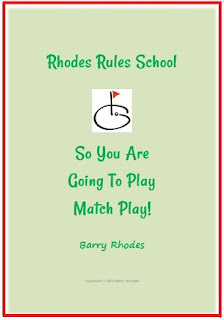 I have a new, downloadable document that I think will be of interest to those readers that play, or are anticipating playing, match play golf. If you have been following my blogs on the Rules you will be aware that there are several Rules for match play that are significantly different to those for stroke play. More about this later. First, I want to highlight one particular area of difference in these two formats of golf, which relates to the situation where one player observes another player breaching a Rule of Golf. In match play, players may choose to ignore any breach of the Rules made by an opponent, because only the players on each side of their match are involved; there is no responsibility to protect the interests of other players entered in the same competition. Whereas in stroke play, a competitor who knows that a fellow competitor has breached a Rule, even if they are not their marker, should bring to light the transgression by notifying the player, their marker or the Committee, because in this case the interests of every other player in the competition are affected if a competitor returns a score that does not include a penalty that they had incurred. Although, in the above Decision it was the player who realised that he had breached a Rule and the opponent acquiesced, the same principle applies if it was the opponent who had discovered the 15th club, had pointed it out to the player, but then said that he was not going to impose the penalty incurred. Both players are disqualified under Rule 1-3. If the above has been of interest to you, I am sure that you will benefit from knowing all of the differences between match play and stroke play Rules. I have authored a comprehensive document detailing them over 19 headings. I am confident that by reading this document just once you will be better prepared for match play golf, whether you are a team manager, team member, or an individual who enters match play competitions. It could make the difference between you winning or losing! 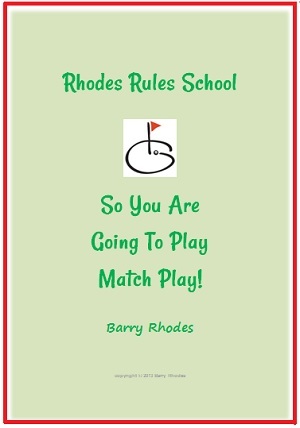 The introductory price of ‘So You Are Going to Play Match Play!’ is just $7 (€5.50 / £4.50). Click on this link for more details and to purchase. Today 2 players were in a match play at our ladies league. One plare told the other she should incur a stroke for tapping her ball prior to teeing off. In defense of herself the player who tapped her ball said she had not addressed the ball so she should not count it as a stroke. The 2 players decided to wait until the end of their game to ask our rules person what the rule was. The rule person said that the player who tapped her ball should have played 2 balls until then of that hole, then come in and ask what the rule is. Therefore, the player who tapped her ball lost that hole and lost the tournament. Is this a correct way to handle a dispute? First, there is no penalty for a player tapping her ball prior to teeing off. How could there be? A ball is not in play until a stroke has been made at it on the teeing ground, Rule 11-3. If you are unsure of a Rule, or a procedure, in match play the Rules don’t permit you to play a second ball, as they do in stroke play. What you have to do, is try and resolve the issue with your opponent. If you can’t agree, a claim has to be made before teeing-off at the next hole. You must notify your opponent that you’re making a claim, agree the facts of the situation and make it clear that you’ll be asking for a Committee ruling. Rule 2-5. I played a matchplay yesterday. My opponent and I were on the green. He was further from the hole and putted close to the hole. He then proceeded the put the ball into the hole standing on my line. Although we halved the hole, I imposed a penalty and took the hole. He challenged this later in the clubhouse after the card was signed. Was I correct in imposing a penalty? If so, do I disqualify myself? You were wrong to claim the hole and your opponent was wrong to concede it to you without making a valid claim, so the result of the hole stands. When your opponent putted out without your permission, he played out of turn and you were entitled to ask him to cancel his stroke and make the putt again after you had played. The fact that he stood on your line of putt is not a breach or Rule, unless he was doing so intentionally to make your putt more difficult, but is was certainly poor etiquette. As soon as you had played from the next teeing ground it was too late for your opponent to make a claim, so effectively he had conceded the hole when he accepted your incorrect ruling and played on without making a claim under Rule 2-5.